SEL-MOTION Motorsports is pleased to present: Project Black Sky. 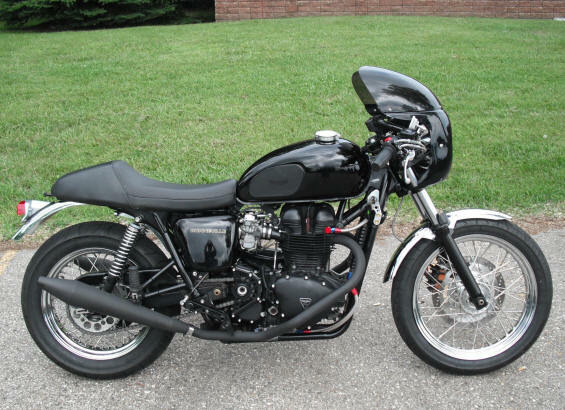 The 2004 Bonneville Black was formally the demo bike at Triumph Detroit and later sold to a local customer of ours who cafe'd the bike to his own tastes. The bike was returned to stock before being sold with the take-off parts being sold on eBay to help subsidize his new bike purchase. The bike has 51,000 miles on the clock and is as tight as a new bike. The former owner took very good care of it and had the dealer service it including shimming the valves recently. The bike presents very well, has been properly sorted and comes with full service records. Before tearing the bike down for conversion, I replaced the tires, brakes and wheel bearings and took it in stock trim to the Smokey Mountains in NC to ride. The bike performed flawlessly showing no signs of wear-and-tear. Upon my return, I started the process of dismantling the bike down to the engine-in-frame, and not much else. This allowed me to perform a proper cleaning as well as giving me easier access to replace corroded fasteners. The cylinder fins were painted black prior to reassembly. 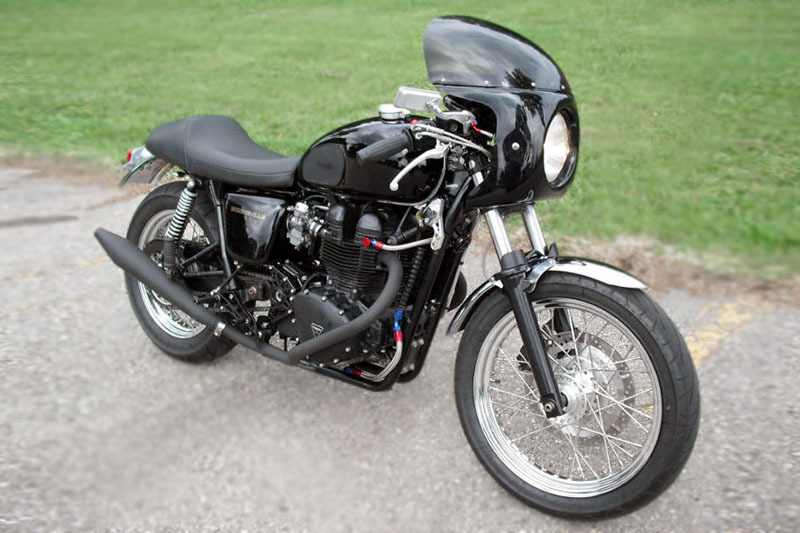 SEL-MOTION offers complete turn-key conversion motorcycles. This motorcycle is shown for the example purpose of what can be built. 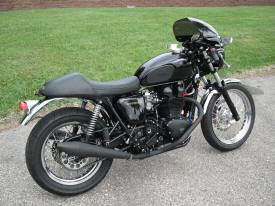 The motorcycle as-shown has been sold, but can be reproduced to the customer's specification. Engine: 790cc oil/air cooled vertical twin, stock. Transmission: 16 tooth front sprocket, 43 tooth aluminum rear sprocket and O-ring chain. Joker Machine billet sprocket cover in black. Carburetion: Keihin CVK 36mm carbs, BellaCorse Air Box Elimination Kit. Oiling System: Earl’s AN stainless steel oil lines. 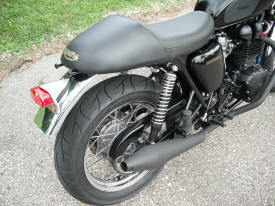 Exhaust System: BellaCorse stainless steel sweptback head pipes and reverse cone mufflers, painted black. Front Suspension: Stock 41mm forks with Hagon progressively-wound fork springs and Bel-Ray 20wt oil,. Superbrace black fork brace. Front Wheel/Tire: Stock chrome 19″ wheel with Conti GO 100/90-19 tire & tube. All Balls wheel bearings. Front Brake: EBC rotor with HH pads with span-adjustable brake lever & Spiegler brake hose. Rear Suspension: 360mm Hagon Classic shocks with chrome Slimline springs & Joker Machine bolt caps. Rear Brake: Stock single rotor disk brake with EBC pads and Spiegler brake hose. Handlebars: Biltwell Ace bars (aka: Clubman Bars) fitted with Joker Machine black billet risers. 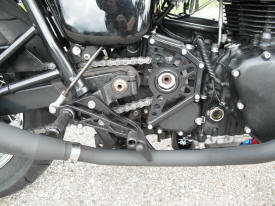 Control Cables: Custom braided stainless steel clutch and throttle cables, Teflon lined. Ignition Switch: Stock switch relocated to RH frame with billet Joker Machine relocation kit. 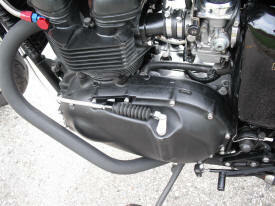 Foot Controls: LSL Billet Rear Sets in black. Headlight: Reproduction Lucas 7″ lamp with Halogen bulb conversion. Joker Machine billet headlight brackets. Tail Light: Polished Aluminum Taillight. Turnsignals: New chrome Super Mini Indicators with 41mm fork mounts and rear relocation brackets. Front Fender: New custom chrome plated steel sport fender on polished alloy mounts. Rear Fender: custom chrome plated steel flat fender. Fairing: Cafe Racer 1/4 fairing installed. Hardware replaced with stainless steel. 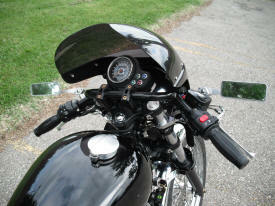 Fuel Tank: Stock with polished Monza fuel cap. Tank badges removed. Seat: Retro-Racer Solo Seat with BellaCorse Seat Bolts.